Living in an industrial town, you gain a unique insight into how production facilities work, how they are laid out for peak efficiency and some of the tools they use to increase production. 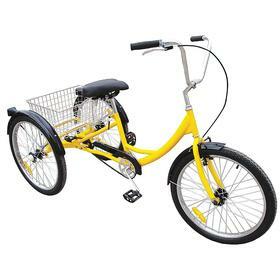 One of the orders that surprised me was when one of the largest manufacturers in our area came to us for cargo trikes. They wanted three- or four-wheel bikes made from reinforced metal that they could use to transport material around the shop. Granted, they have a large shop. I would estimate that the entire plant is about four city blocks large. It takes up a good chunk of land, and a lot of time can be lost in transporting employees and materials from one area of the shop to another. I suppose I would have thought that they would use some modified golf cart for getting around the shop. And, while they do have a few of these golf carts for the top level staff to use, they find that the pedal carts work better for transporting small amounts of material around the shop. There are two large advantages with this method. The first is that these bikes require very few repairs. A little grease, a little air (some even have airless foam tires), and these will run for years with little to no maintenance. The other advantage is that these carts much less than then a golf cart. So they can invest in more of them, increasing the productivity in a greater area of the shop for less investment. In the day of digital everything, the thought of employees pedaling carts around may seem a little quaint. But, as an economical way of moving small amounts of ancillary supplies to their destination, these carts are unbeatable. Are Commercial Cargo Trikes Good For Residential Use? These carts are well-built with many of them lasting for 20 or more years of service. So what about buying one for daily transportation? The first drawback is that they are made out of heavy steel. This drives up the price, making it a less economical option. The added weight of their commercial construction also detracts from their usability, creating a real tank of a machine that is difficult to pedal around town, lift over obstacles or get up a hill. Where these machines excel is in the flat space on the smooth floor of a production plant. They don’t perform very well outside of those narrow parameters. However, there are excellent bicycles on the market for commuters to use. You can either add racks to an existing bicycle or pick up one of our custom creations that are designed with a more extended, larger racks to accommodate the needs of the urban family. Additionally, our bikes are made from titanium — one of the lightest materials available — to create an enjoyable, easy-to-pedal ride. Some people try to use trikes to get around town. However, trikes are notoriously difficult to pedal and awkward to maneuver. Choosing a bicycle works better in the long run for the bike-minded family. A bicycle is an essential tool for college. If you plan on getting from class to class with enough time to still grab a latte, you’ll need something faster than your two feet. Some kids opt for a skateboard. If you have the balance that is great. Scooters work, too, but the dork factor is high. Mountain bikes are the preferred transportation method. They let you get through campus easily while using puncture-resistant tires that can navigate curbs and stairs with ease. We often have riders wondering if they can purchase a mountain bike that will handle the urban challenges of riding through town while also be an excellent option for riding off-road on the weekends. The answer is affirmative, however, there are a few key features you need to make sure to look for. The first consideration (always) is sizing. You need to purchase a bicycle that is your correct size, base on your height. Walmart, frankly, gets this wrong. They sell bikes based on the wheel size, with their adult bikes being sold in a one-size-fits-all fashion. Use an online size chart to get your correct size and then you can measure any bicycle from the top of the seat tube to the middle of the pedal cranks to get that bicycle’s size. Even if you are buying used (an excellent option! ), you must get the correct size. Equally important is that you buy a bike with double-walled wheels. These reinforced wheels will save your bicycle if you come off a curb wrong and hit the wheels too hard. Even one wheel replacement will cost $60, and single-wall wheels are surprisingly susceptible to damage when you least expect it. Some of these wheels can be detected simply by examining the rim design from the outside. But, if necessary, you can deflate a tire and move the tire to the side to check. A bike with these two features will deliver years of dependable service. Mountain bikes need low-end gearing for going off the road. Sometimes it feels like their gearing cannot get low enough. However, when riding through the city, it is relatively easy for an in-shape rider to max out the gears. This isn’t a deal-breaker unless you have a long distance to ride. If you are doing a lot of cross-town commuting, you’ll likely want to invest in a mountain bike that also can get you across town with minimal effort. Shopping local is always ideal as it supports the community. Plus, you can get hands-on advice regarding the type of bicycle you should buy. That said, Pawn shops often have good deals. Make sure to negotiate with them as their initial prices are always a little high. Online has become an excellent place to bicycles directly from the manufacturer. Shopping online for brands like Diamondback and Raleigh is a stellar way to get a good price — especially if you get it on sale. We could create a top-10 list to try to create the ideal bike, but the price is the biggest factor when you are in college. If you can find a bicycle that suits your needs while also having these three features, you can be convinced that you have a quality setup that will get you through your college years. Over and over we see advertisements for courses like the Barnett Institute For Bicycle Mechanics. Just as with the National vehicle repair licensing programs, they have a core certification (Bicycle Assembly and Maintenance) followed by many subset courses you can attend to increase your knowledge and versatility. But are these courses needed? I have maybe met one person who had attended Barnett’s wheel lacing program (which makes sense, wheel lacing is difficult to master). But I’ve never met someone who started their mechanic’s training there or received the bulk of their training through them (out of the 10 or so mechanics I know). In some ways, bicycle wrenching is the wild-wild-west of repairs; there is little by way of standardization or accountability. Poor mechanics go hungry; good mechanics have long waiting lists. It’s the law of supply and demand. So how does one become a bicycle mechanic? Especially if you are outside the “inner circle” of your local cycling industry. In this article, I’m going to lay out the three-step pathway that most people follow. There are so many Youtube videos you can follow, and if you want a comprehensive online course, there’s affordable on you can buy and go through. It helps to know that a “cone” isn’t something that you put ice cream on. You want to become conversant. Ideally, you are going to take the next step and begin getting practice. You can start by adjusting the derailleurs and brakes on your bicycle. Learning how to perform basic maintenance is an excellent place to start. In this phase, you want to expand this experience. Purchasing bicycle from a local thrift store or garage sale, fixing it up, and then selling it or donating it to the local homeless shelter is a low-pressure way to hone your craft. Try to do two to three of these bikes if your budget allows; it is way cheaper than paying for training, and Youtube makes an excellent master. Joining your local cycling club is a good step for those of you who are active riders. This isn’t the most direct way to build connections to the shop owners, but it can put you in touch with people who know other people. If nothing else, it can be an excellent place to get references. As you go through Step 1, you will be in the shop all the time to buy parts. This step is key. It will be excellent if the crew at your local shop sees you once or twice over a span of a couple of months. They’ll appreciate the consistent business and that you have are comfortable with bikes. It is key not to come off as a know-it-all during this phase. You want to be teachable, but you also don’t want to pepper them with too many questions and cross into that “annoying” category. Some communities also have opportunities where you can volunteer helping to repair bikes in the community. While this won’t directly lead to a job, it can help you expand your skillset and might put you in contact with local mechanics who are also volunteering. Most bike shops have a need in the summer for a seasonal bike builder. There are too many bikes flying out their doors for their repair team to keep up. Most of them rely on college students for this entry-level position, with the idea that this role will wrap up at the end of the season. This is an excellent place to begin gaining the knowledge and respect that comes from working in a shop. In many cases, you will need two or three years of working in the same shop before you begin being trusted to help with repairs. Depending on the shop, they will likely ask you to help them with simple repairs such as tire changes for walk-ins. And then, as your skillset progresses, that will lead to more responsibility. Be vocal about your desire to become a bike mechanic. If the boys know you are interested in making it a full-time gig, they’ll help push you forward as a candidate the next time there is an opening. Most mechanics learn through apprenticeships — hands-on training as the knowledge is passed from one mechanic to another. . I have seen some local shops sign up for the Park Tools trainer program. These shops invest in the formal training for their mechanics. Getting in with a shop that does that can help expose you to advanced training and certifications you would otherwise be unable to get. Being a bike mechanic is fun “hobby job.” The camaraderie and enjoyment are unequaled. However, it is difficult to support a family on the wages paid by most shops and is typically only a career that is pursued by college kids and husbands whose wives have lucrative careers. Similar to how people become baristas for “fun,” few bike mechanics stay in this role if they need serious income. Gt bikes continue to be at the top of the online mountain bike lists. Run by Pacific cycles, the company had several years where their future was unclear. Was the company simply going to be a “cash cow” for its investors as it slowly slid into oblivion? Or was the company going to invest in the necessary funds in research, development and sponsored riders to stay at the top of the sport? For almost ten years this question mark hung over the company as both low end and moderately high-end bikes were produced. Similarly to Jamis, they have perfected the art of creating an affordable bike. And now, everything they create is judged on their brand history and price points instead of their comparable market position. This puts GT at a large disadvantage and makes them the decided underdog. They aren’t letting this dissuade them, however. And their GT Force Carbon Expert is an excellent example of how far they have pushed their technology and why they need to be considered along with the other top bike manufacturers like Specialized and Trek. First off, the Force Carbon Expert is an ideal Enduro / All Mountain bike. It has 150 mm of travel on the rear with a 170 mm fork, offering the comfort needed to navigate the gnarliest rock gardens confidently. The rear uses the new Path Link system which gives the bike the large travel of the I-drive system, but with a lower center of gravity and less pedal bounce. This high pivot makes it great for going over the obstacles — even better than many downhill bikes. However, because the path link moves the shock and the bottom bracket, you don’t get the feedback from the chain as you do on other bicycles. The long top tube and short stem help deliver a lower center of gravity with an aggressive rider position. The large carbon monocoque frame shape is hard to miss. Since the bottom bracket moves in concert with the rear wheel, it is possible to add stronger chain stays and create a setup that delivers more power at all riding angles. There is a strong reliance on the Rock Schock system. Most riders would appreciate seeing a White or Fox system at this level, but Rock Shocks is an excellent system and one that is overlooked. It is everything you want in an Enduro bike. It is extremely light but with over-built shocks, tires and brakes to deliver that control the riders live for. Rounded out with a Sram X1 system, you have consistent shifting and an unstable build. If you want more travel and a more aggressive down-hill type course, you will likely need the Stanchion. But the Force GT is much lighter and better suited for less technical courses, or for the rider who doesn’t mind sacrificing a little performance for a lighter rig.